The ethos with this, our first A/W, collection is that opposites attract and often complement each other. So, instead of shying away from mixing concepts, they should be embraced and worn with confidence. Leather and lace are two of the key trends for the upcoming season and we love the look of the goth-glam leather pieces mixed with the delicate, ladylike lace pieces. Our fave (ssshh! don't tell anyone!) 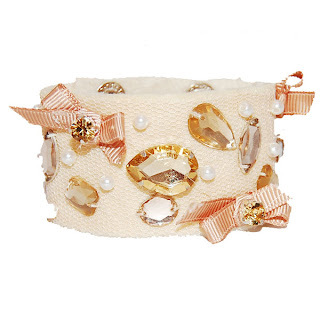 in the Leather & Lace collection is this beautiful Beige Lace & Jewel Cuff, priced at £8. Adding a hint of pretty and girly to an edgy outfit, this piece is particularly eye-catching because of its opulent jewels and bows. We are in love! 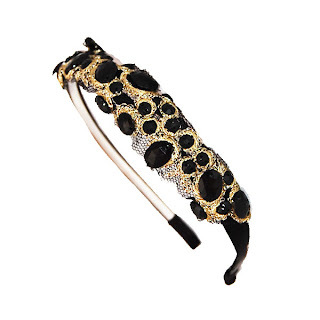 Next up, is this super-gorge Black & Gold Lace Stone Alice Band, priced at £8. The perfect accessory to rock and vamp-up a look. With its lace panelling, which is decorated with gold netting and black stones, it adds another dimension to the most basic of outfits. 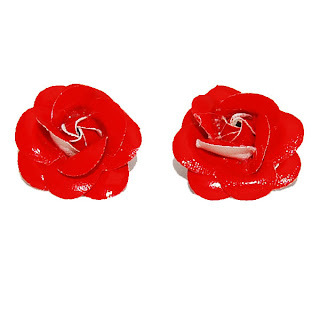 These Red Faux Leather Flower Earrings are amazing and are priced at an even more amazing £5. Bright and beautiful, they add much-needed colour to dull Autumn days and nights - a true statement piece! Just make sure they're worn with tied-back hair to get the full effect of their beauty and to stand out from the crowd. Go check out the other pieces in our A/W 2010 Leather & Lace collection. As a reader of our blog you can get an exclusive 10% discount off your order with the code BLOG10.